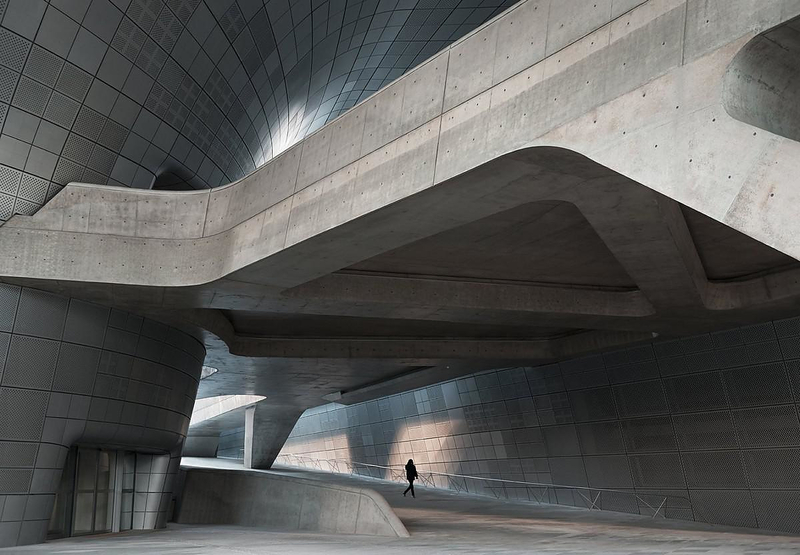 HomeBlogArchitectureDongdaemun Design Plaza by Zaha Hadid Architects. 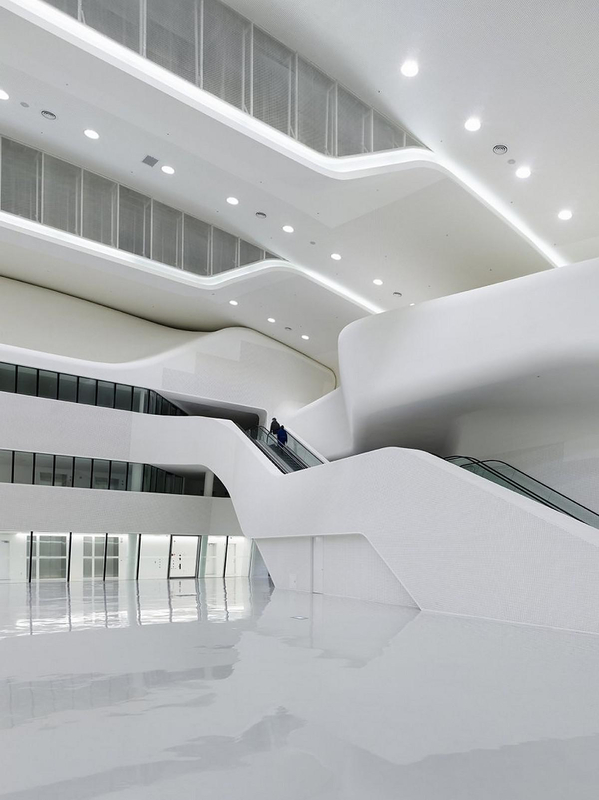 The neo-futuristic Dongdaemun Design Plaza is the latest creation of renowned architect Zaha Hadid and associate Patrick Schumacher. 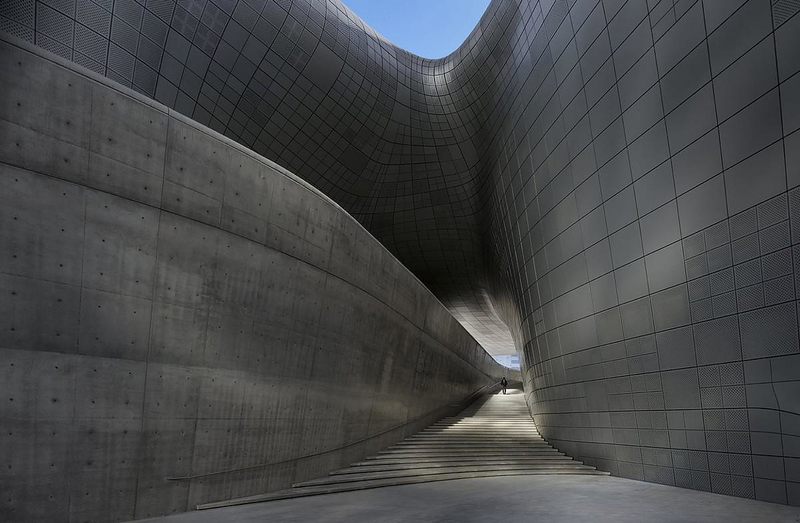 It is located in Seoul, Korea. 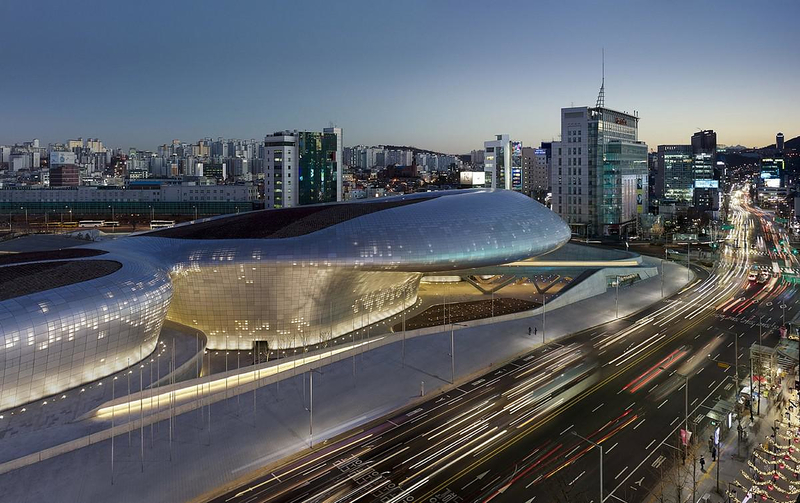 In 2010 Seoul was the designated “World Design Capital” for that year and the Dongdaemun Design Plaza was one of the main arguments that helped the city win its bid for this prestigious award. 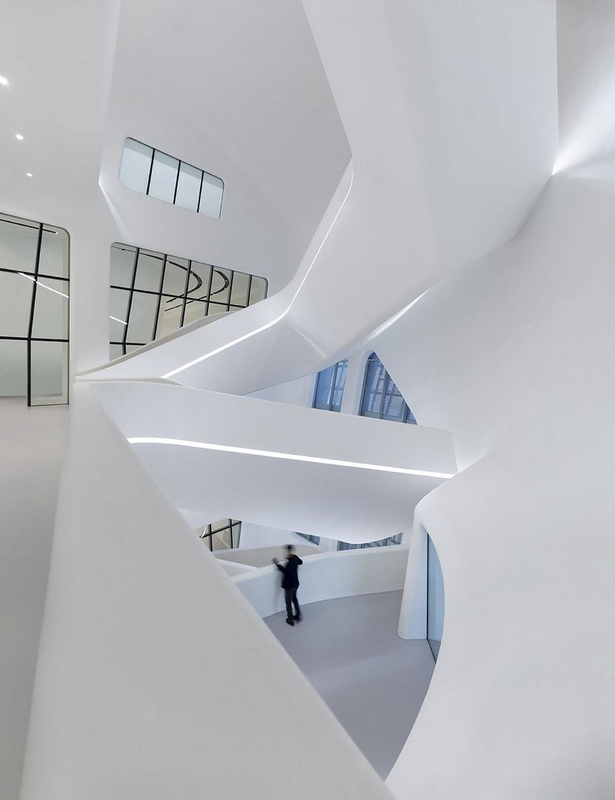 The DDP, for short, is an organic shaped building featuring the characteristic curvy lines that make Zaha Hadid’s designs so easily recognizable. The main structure is made of metal and concrete. 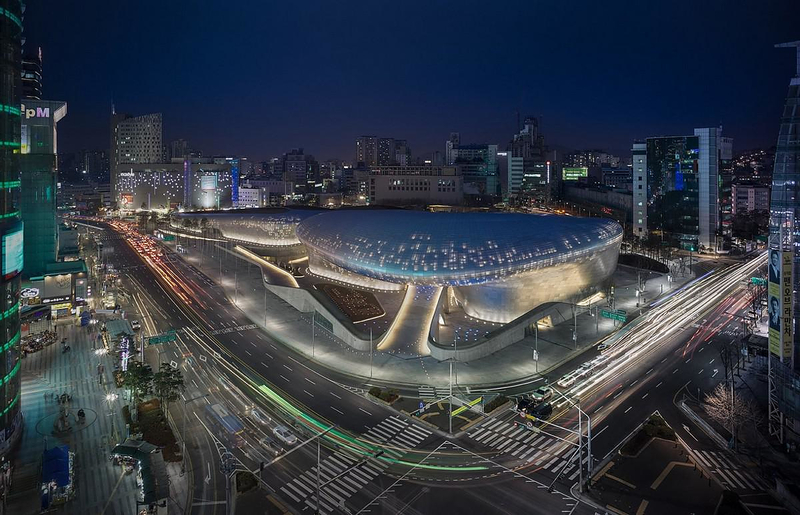 The Dongdaemun Design Plaza was designed to with a vision to become South Korea’s fashion and design center, and enhance the role of Seoul as the Fashion center of Eastern Asia. DDP features a walkable park on its roof, large expositional spaces, retail spaces, and it embodies parts of the old city fortress that were uncovered during excavations. 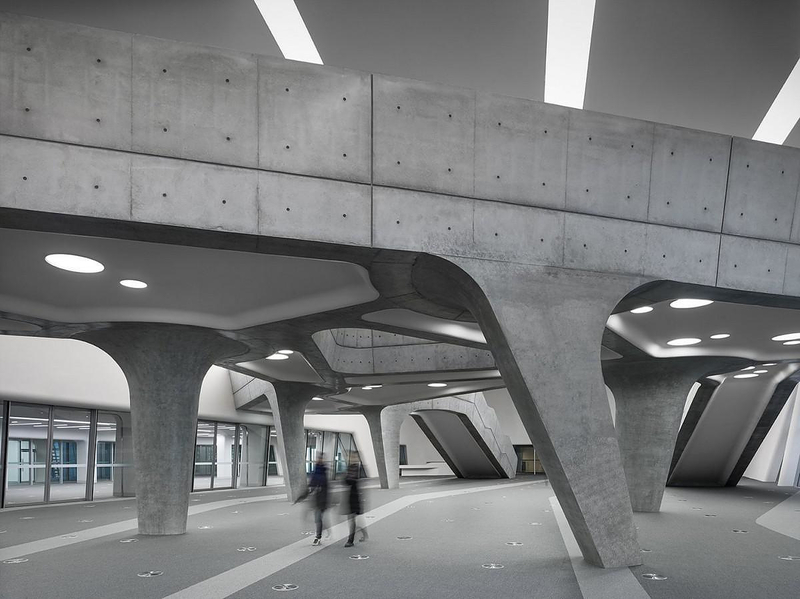 Innovation, futurism and historical elements all combined in one emblematic building complex. 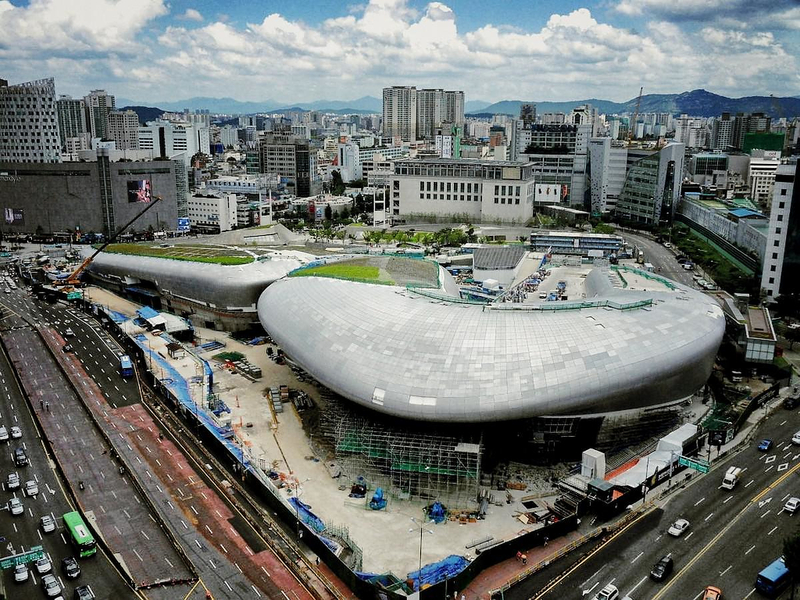 The building is located in the historic Dongdaemun district at the central-eastern part of Seoul. This particular area has a history of being the location of the ancient Eastern Gate of the capital fortress and a buzzing trading center full of small shops and merchants. 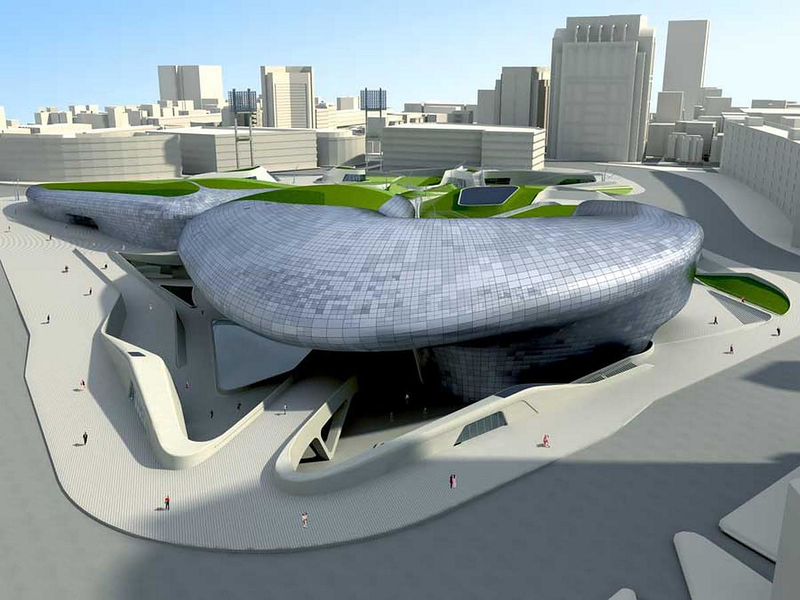 The new Dongdaemun Design Plaza building is meant to be a landmark to replace an old stadium that had to be demolished. 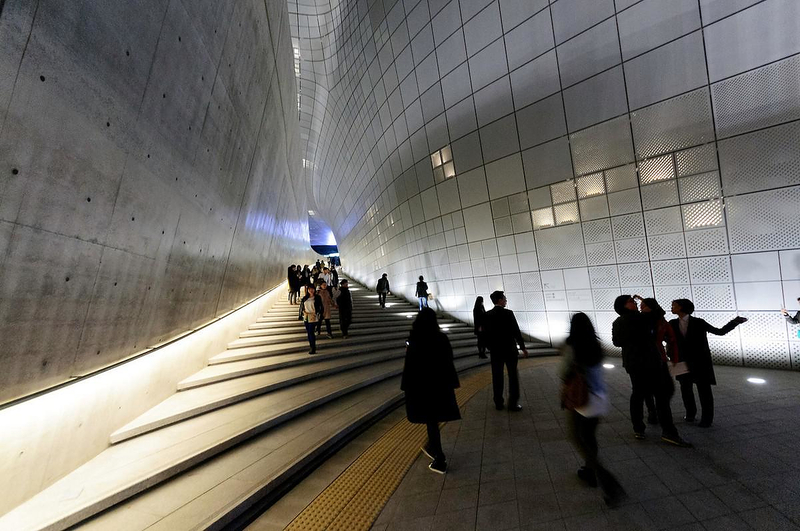 Being new, innovative and futuristic, the Dongdaemun Design Plaza bears a remarkable dissimilarity with its urban surroundings. It stands out immediately and is a dominating presence in the area. 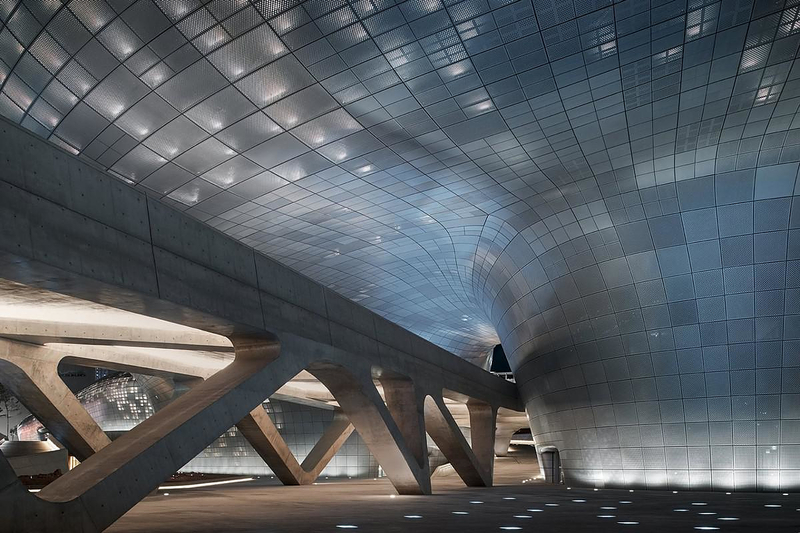 The building is striking, even more so at night, when the built-in LED light grid illuminates its blob-like form. 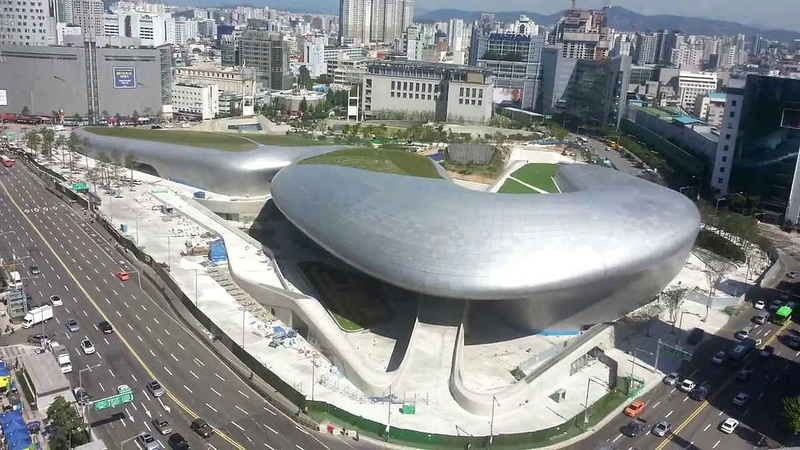 It looks as if a spaceship landed on top of one of the most buzzing trade streets of the South Korean capital. 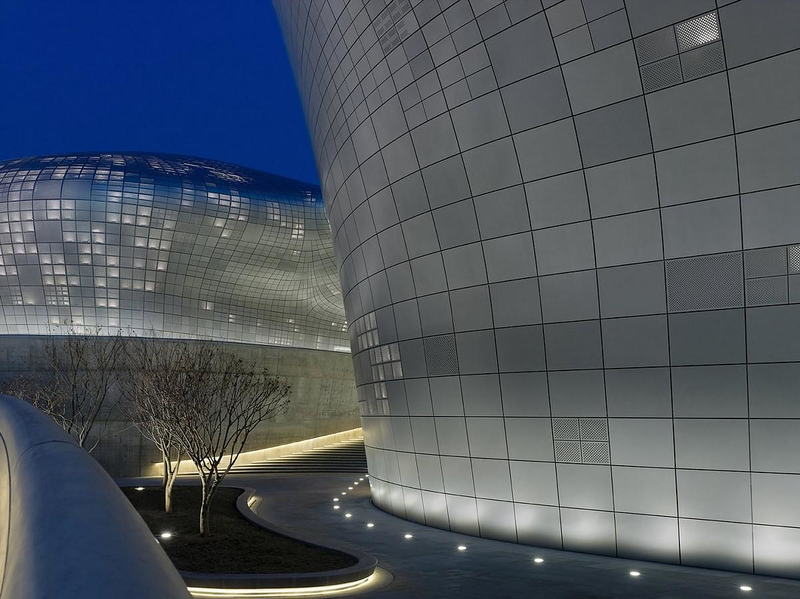 The LED lighting grid is incorporated to a metallic skin-like surface that gives a neo-futuristic style to the building. 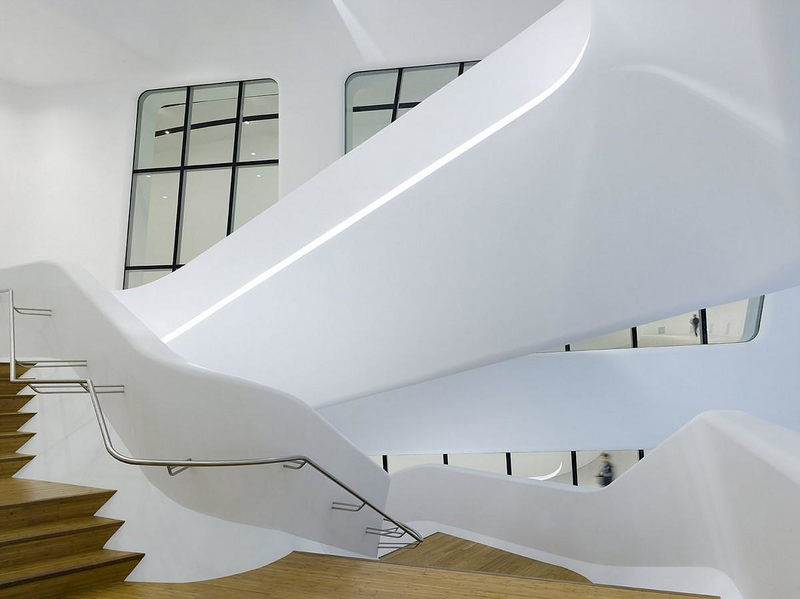 In order to fully cover the surface of the building more than 45,000 metal panels were used. 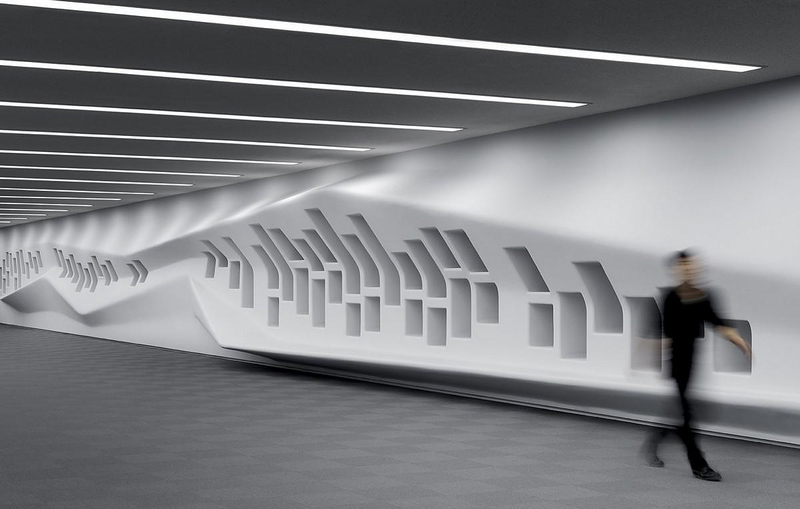 Each panel features a unique size and shape, methodically designed and manufactured via the use of BIM software. 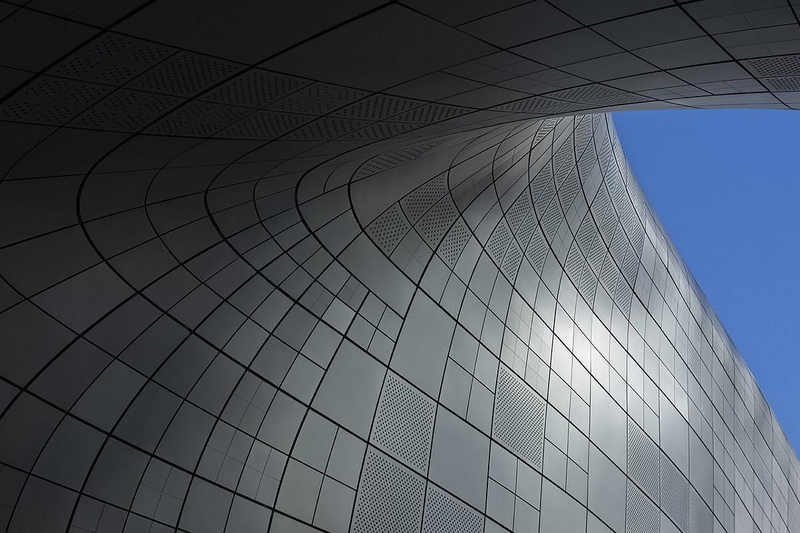 This type of software made the construction process a lot easier for the local Korean contractors who were used to usual manufacturing blueprints. 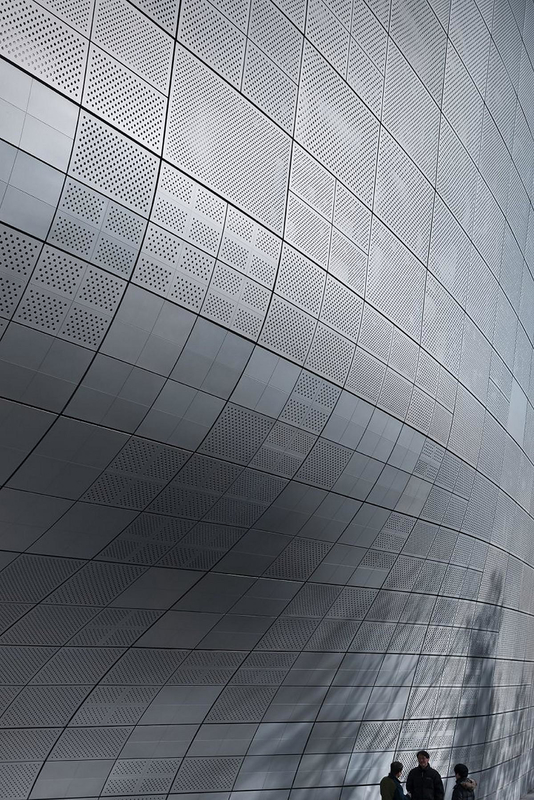 The metal panels feature a solid or perforated surface to allow a variation of the building’s external skin pattern, while some allow glimpses of the interior to show. 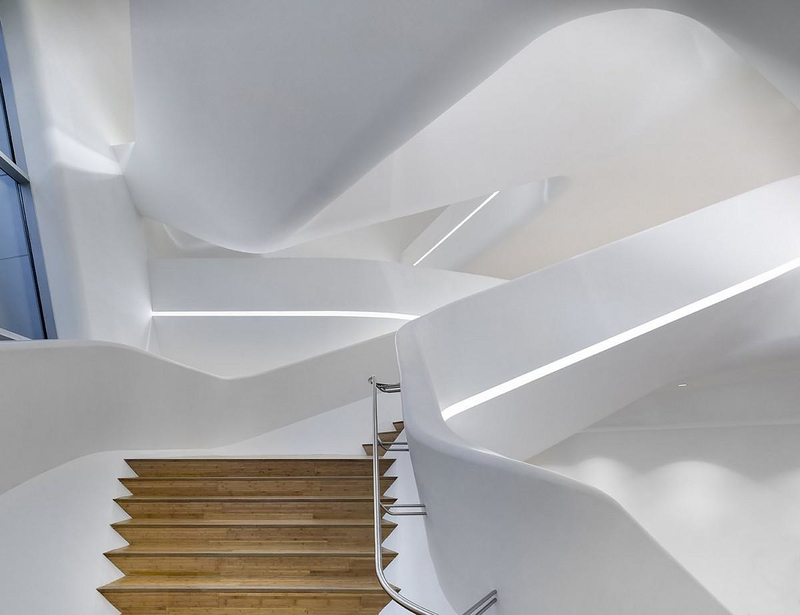 In the interior most architectural elements embody Hadid’s characteristic organic forms. 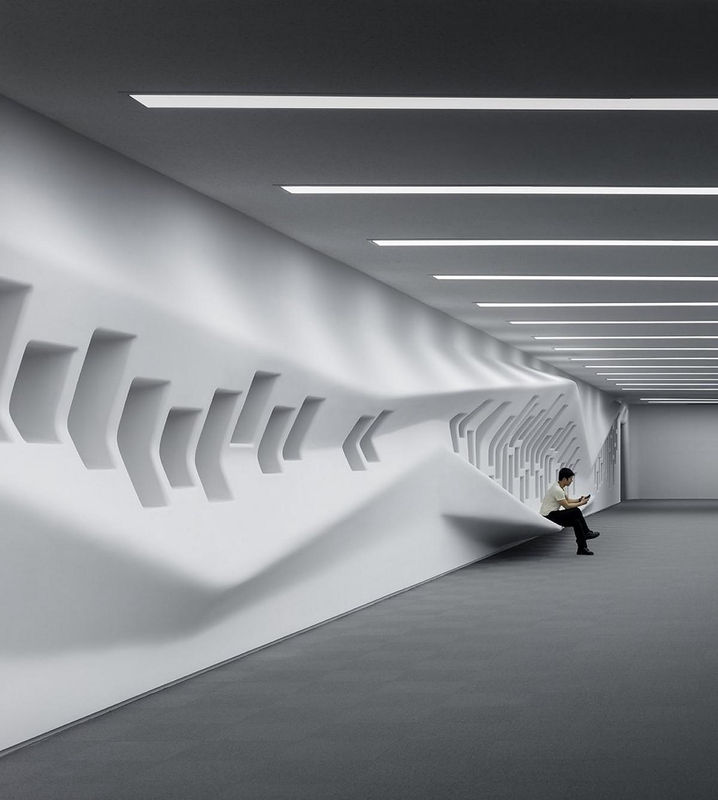 The form of the surroundings guides the flow of the visitors from one place to the other. 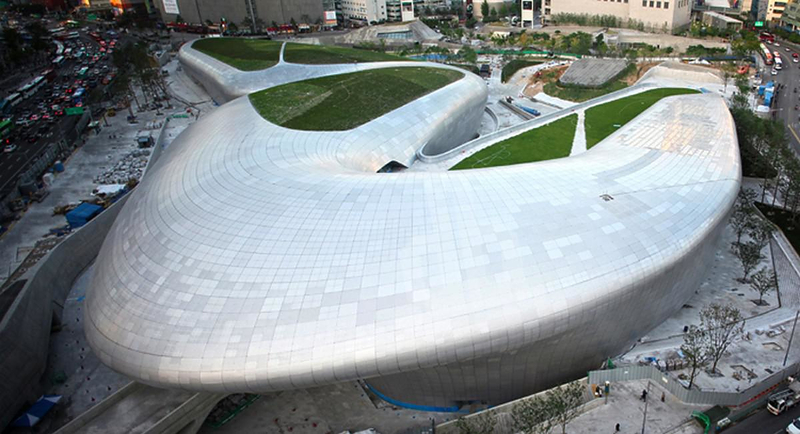 The Dongdaemun Design Plaza accommodates various design related uses. 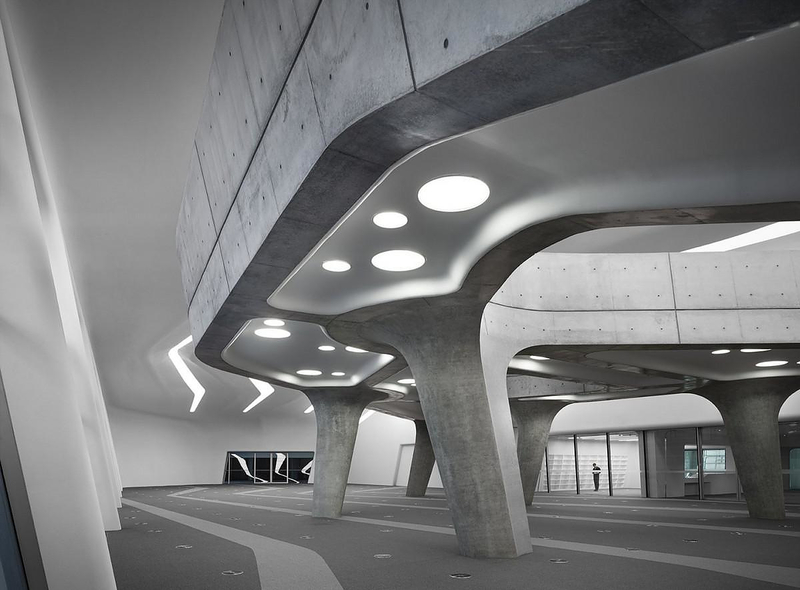 It includes a “Fashion Information Center” for fashionistas, shop-n-go stores, coffee shops, as well as exhibition spaces and concert halls. 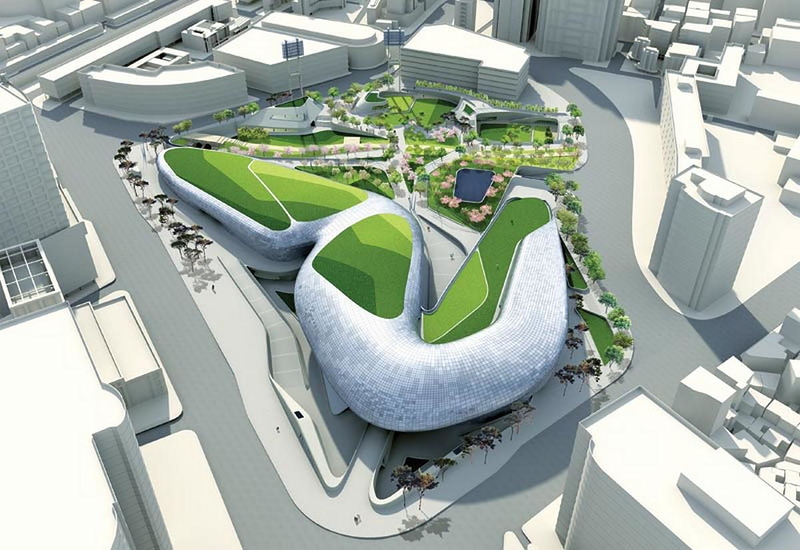 The combination of commercial and exhibition uses makes the Dongdaemun Design Plaza a vivid, multifunctional cultural center.